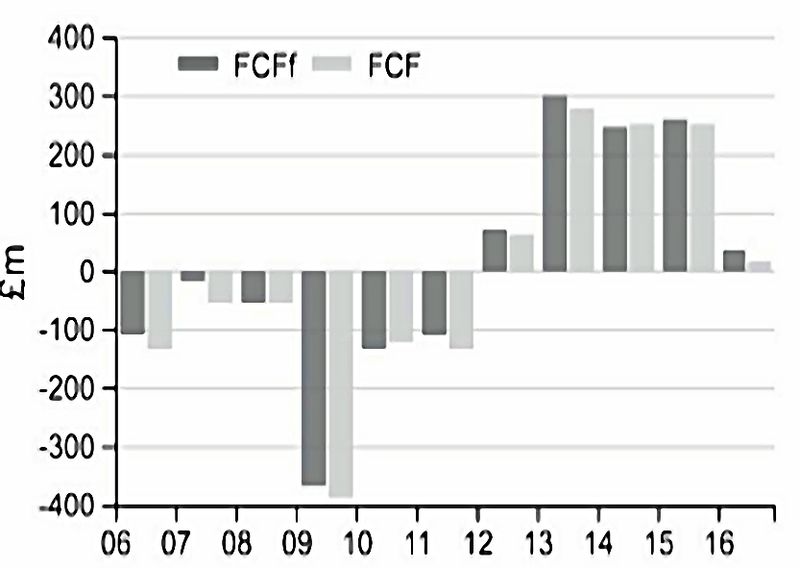 Profits were rising, but free cash flow was not. Globo turned out to be an accounting fraud and it went bankrupt in 2015. Here are the calculations for Domino’s. Domino’s had net cash from operations of £69m. 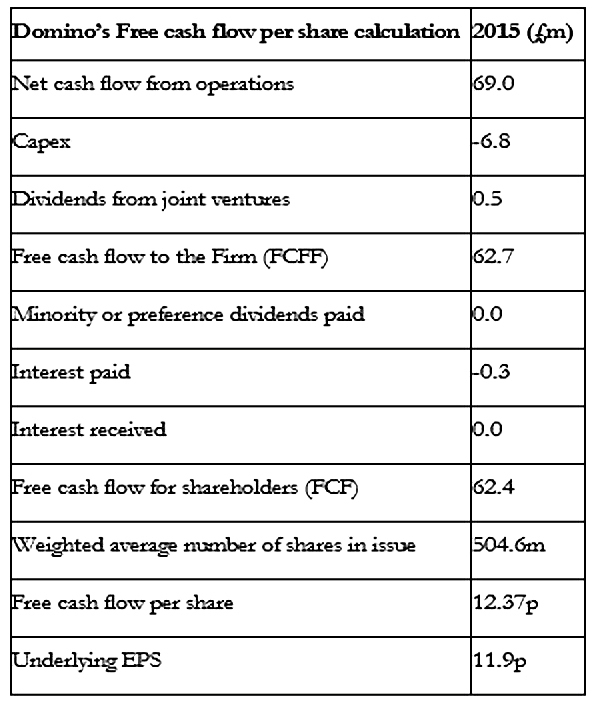 FCFF = 69 – capex of £6.8m + dividends from joint ventures of £0.5m = £62.7m. 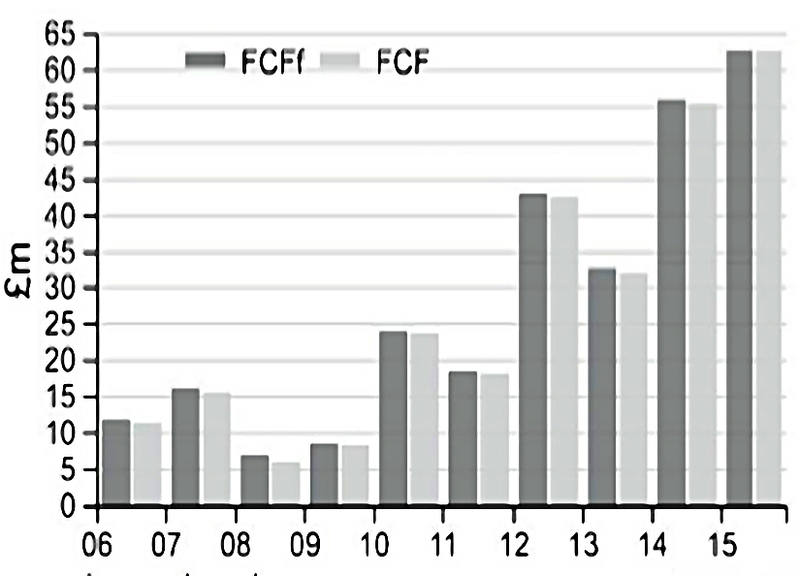 The FCFF and FCF grew nicely. 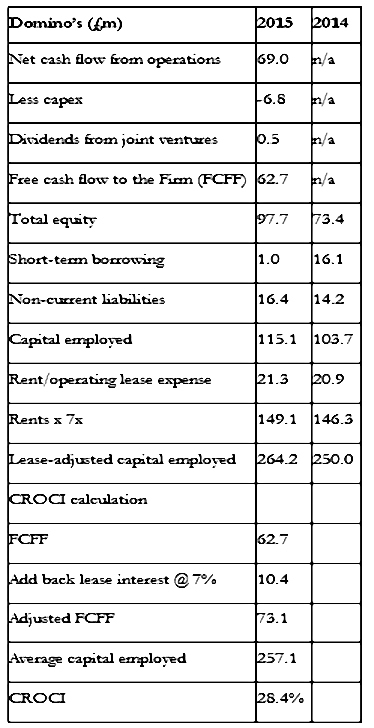 Domino’s has very little debt / interest payments, so almost all the FCFF turns into FCF. Phil examines how good Domino’s has been at turning its operating profits (EBIT) into cash. 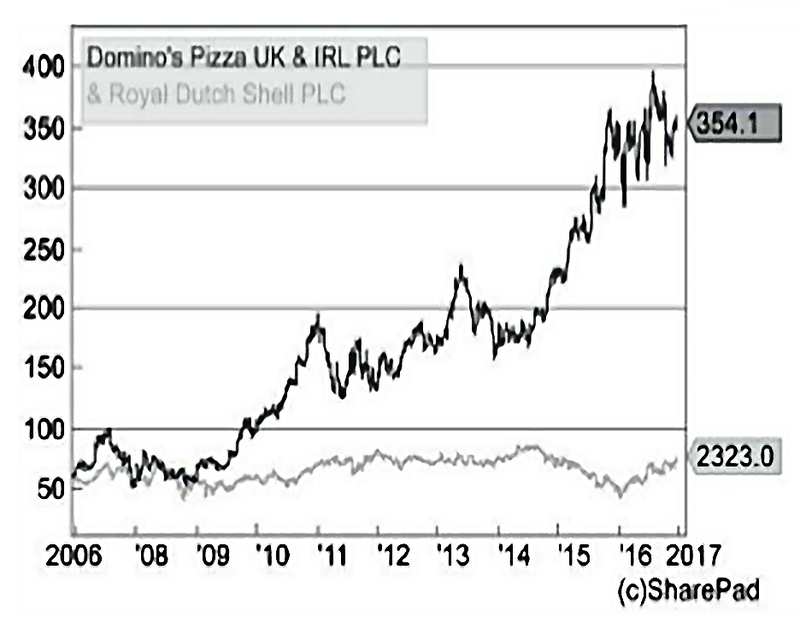 Domino’s scores above 100% for 9 of the last 10 years. 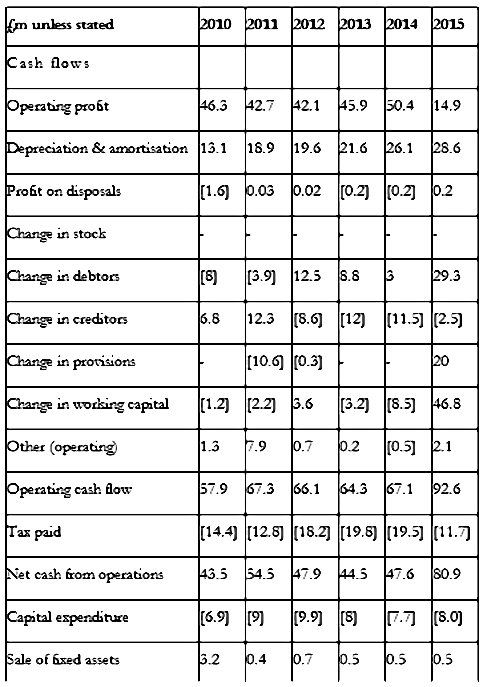 The operating profit was £73.2m. Domino’s does not have a final salary pension scheme, so there can be no adjustment for top-ups. 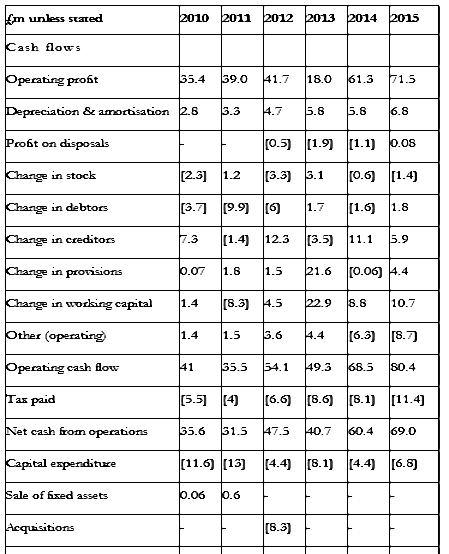 For Domino’s in 2015, £73.2m of operating profit was turned into £80.4m of operating cash flow. 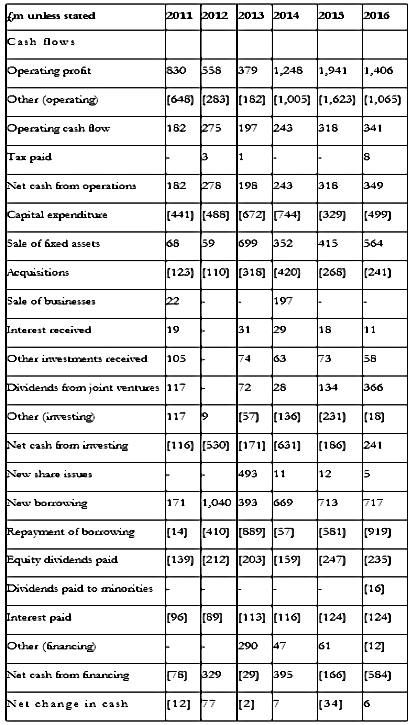 That is an operating cash conversion ratio of 109.8%. Domino’s had a low stock ratio of 1.95% in 2015. Domino’s had a very small debtor ratio of 2.5% in 2015. Compare this with Redcentric, whose share price crashed in 2016 when it was revealing that it had misstated its profits. 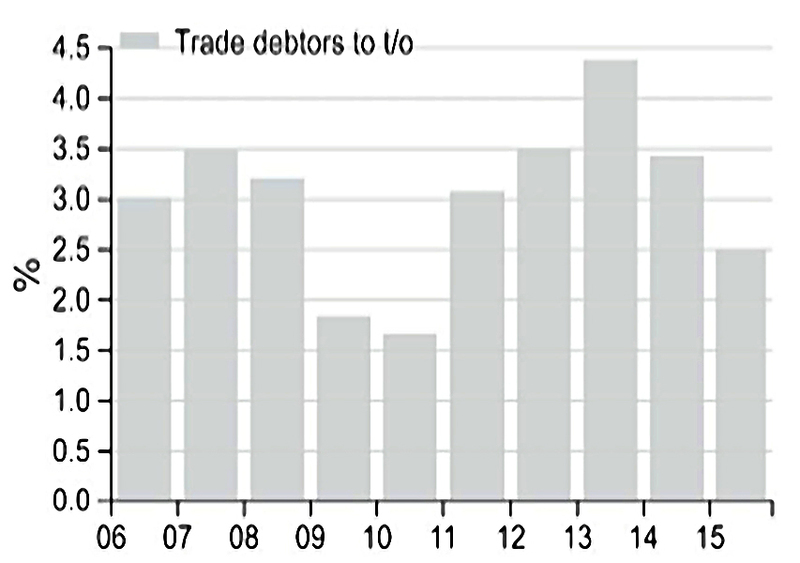 There had previously been a big increase in the debtor ratio. 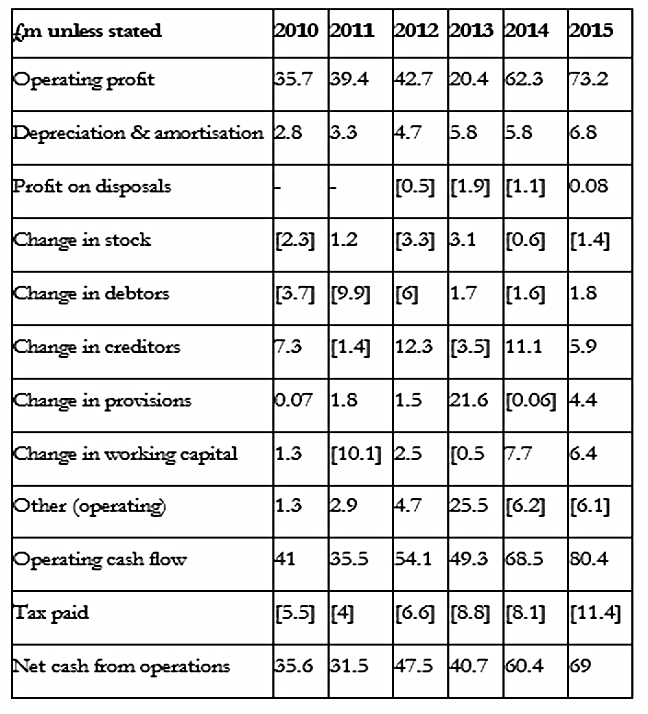 Domino’s capex ratio in 2015 was £6.8m / £80.4m = 8.45%. 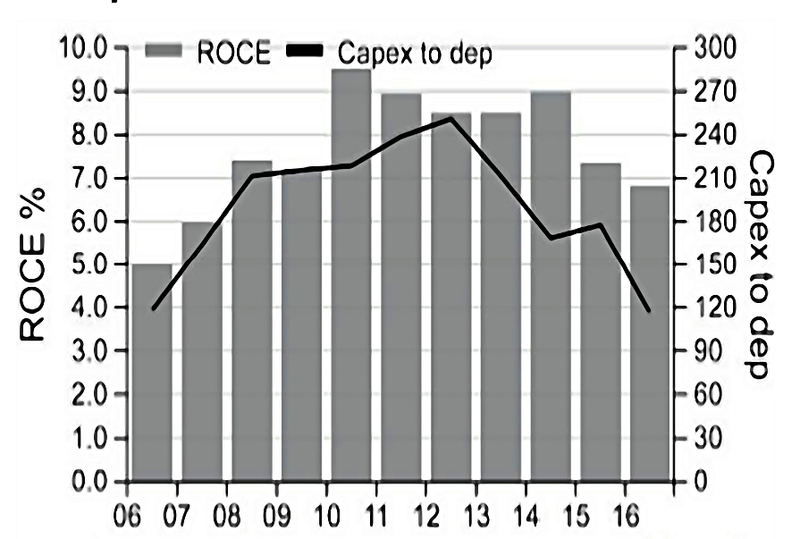 The (non-financial) companies with the lowest capex ratios (as at November 2016) also have high ROCE figures. 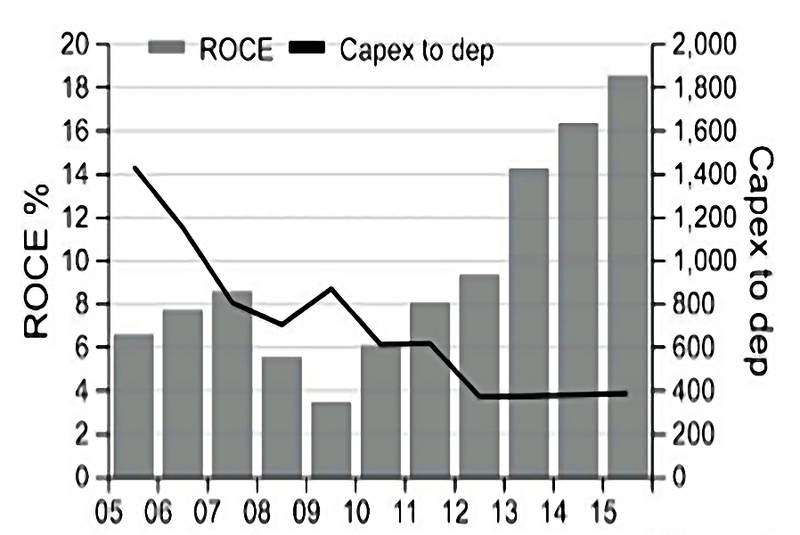 The next table shows the opposite: high capex ratio companies with low ROCE. 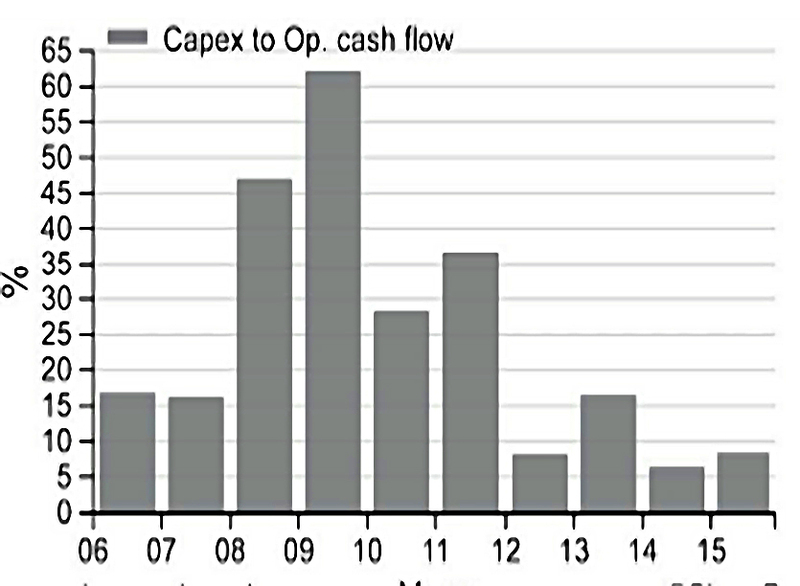 Domino’s capex ratio has come down nicely and is now less than 10%. 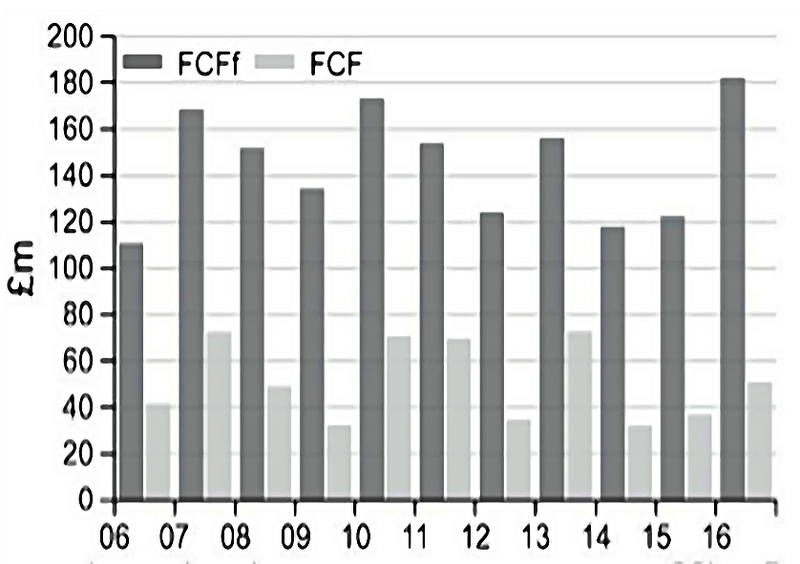 Back in 2008-09 the firm was investing in distribution centres, and the capex ratio was mich higher. So it’s worth thinking about how much more expansion can take place without another set of distribution centres needing to be built. 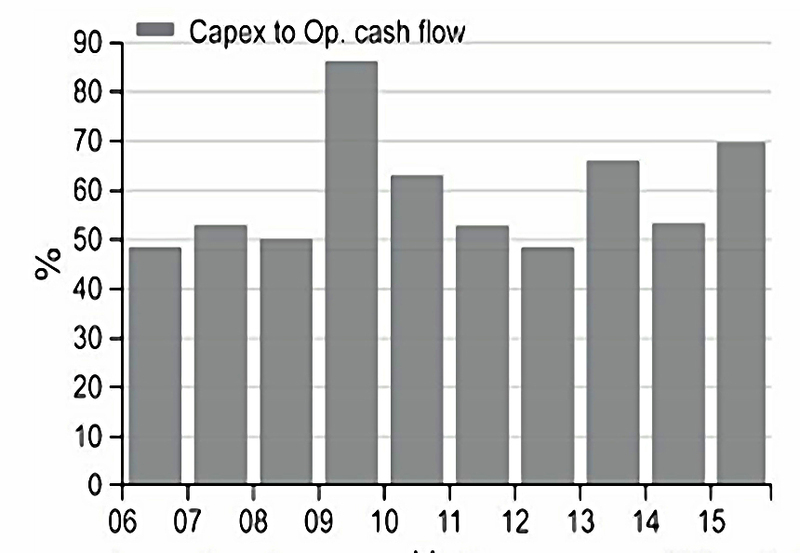 Domino’s capex spend has been the same or more than its depreciation from 2006 to 2015. 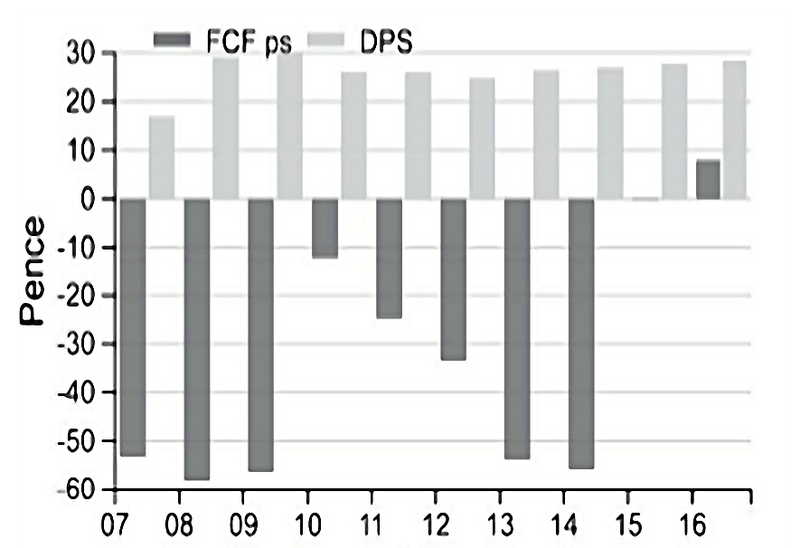 Domino’s spend is at the lower end, but not so low as Wetherspoons, which spends less than depreciation. This turns out to be because Wetherspoons separate out their spend on new pubs. ITV also appears to spend too little. ITV has to spread the cost of things such as licences, customer contracts, software and programme libraries over their useful lives and these do not need to be matched by outflows of cash every year. Easyjet is an example of a company that spent a lot on new assets. 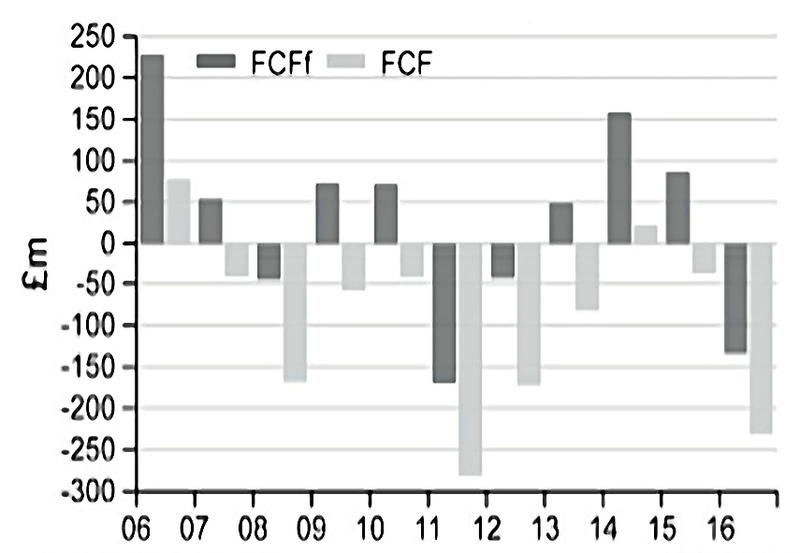 Its capex-to- depreciation ratio was well over 100% from 2006-15, which hit FCF. 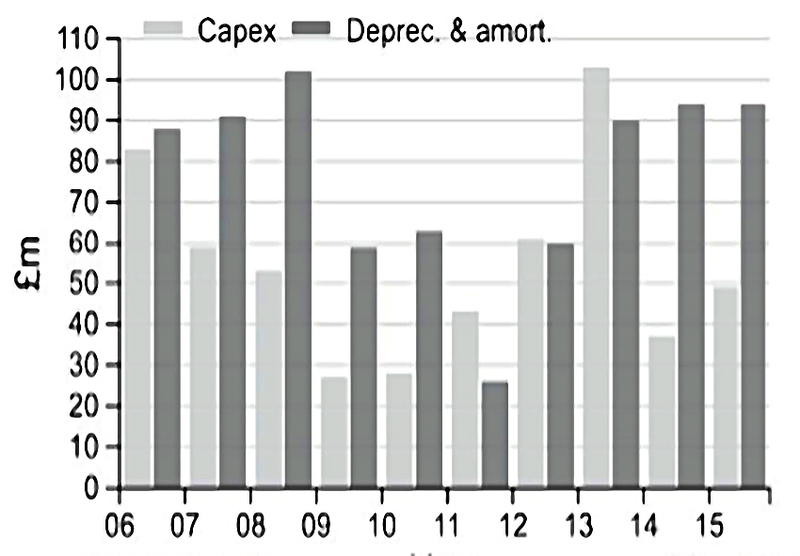 Here, profits have fallen but capex has remained above depreciation. The table above calculates Domino’s CROCI for 2015. 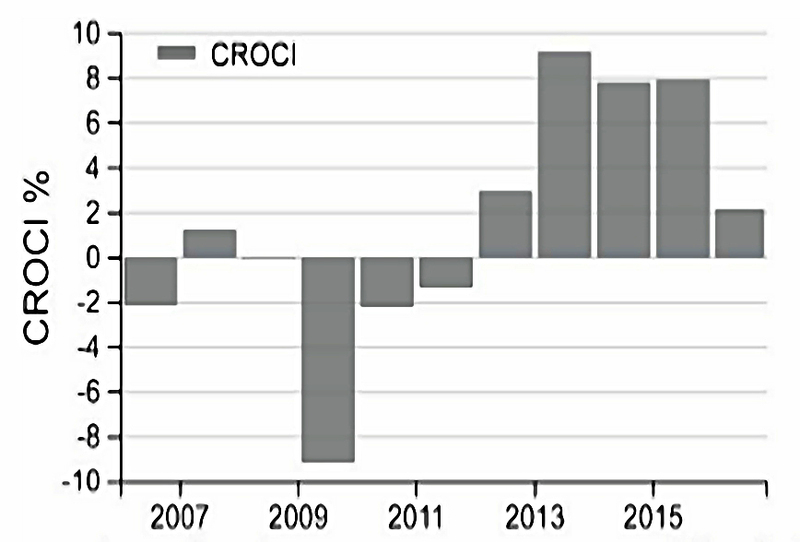 Domino’s CROCI was regularly over 15% between 20016-15, reaching 28.4% in 2015. The average for the 10 years was 18.6%. We saw last time that its lease-adjusted ROCE was 18.6% in 2015. But its CROCI is only 7.9% – below Phil’s threshold. Easyjet is one for the future, when capex drops back down to maintenance levels. 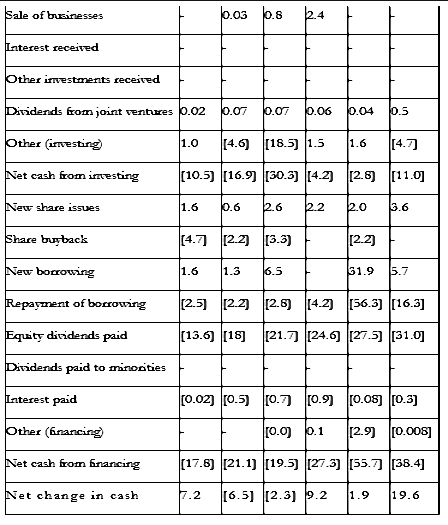 The table shows the 2015 calculation for Domino’s. 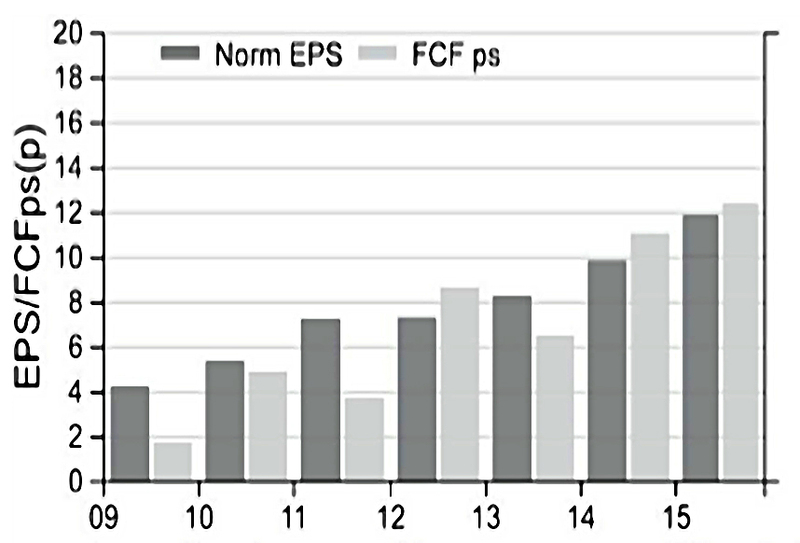 EPS is 11.9p and FCFps is 12.4p. 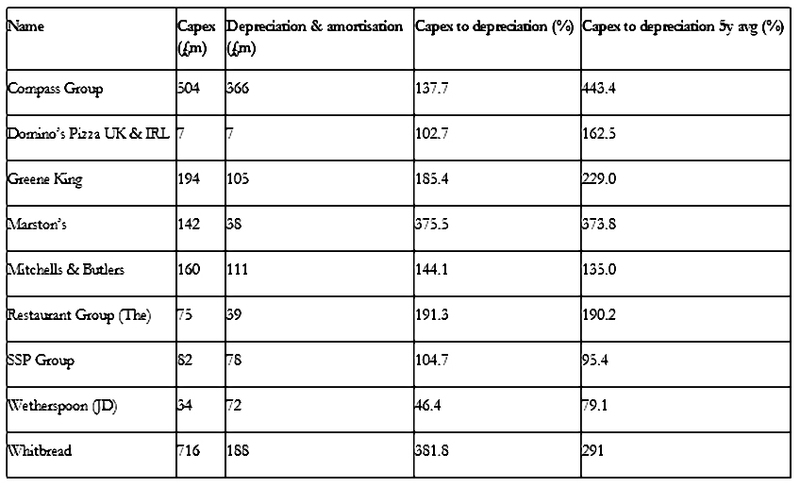 Phil uses Sainsbury’s – which like most supermarkets has spent more on capex than depreciation (leading to low FCFps) as an example. 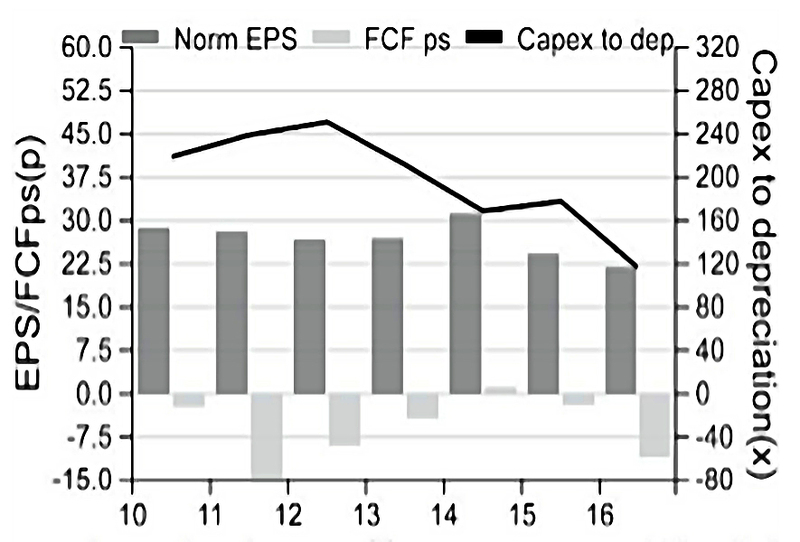 However, this has not lead to an increase in profits (or EPS), which leads Phil to conclude that this was maintenance capex. Which means that depreciation was too low and profits too high. 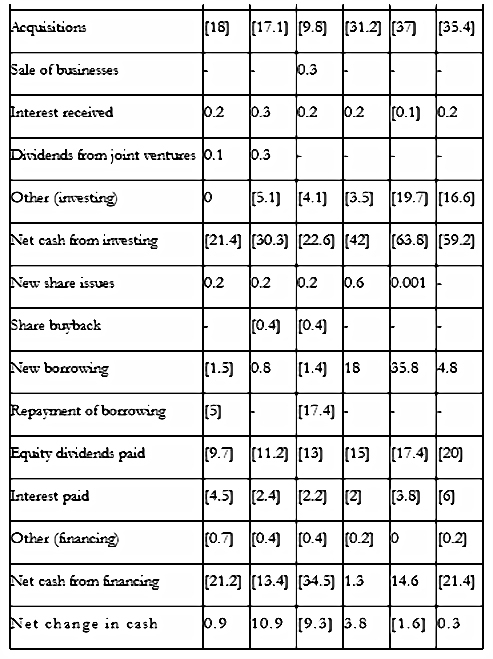 The share price was flat from 2005 to 2015, and eventually the dividend was cut. 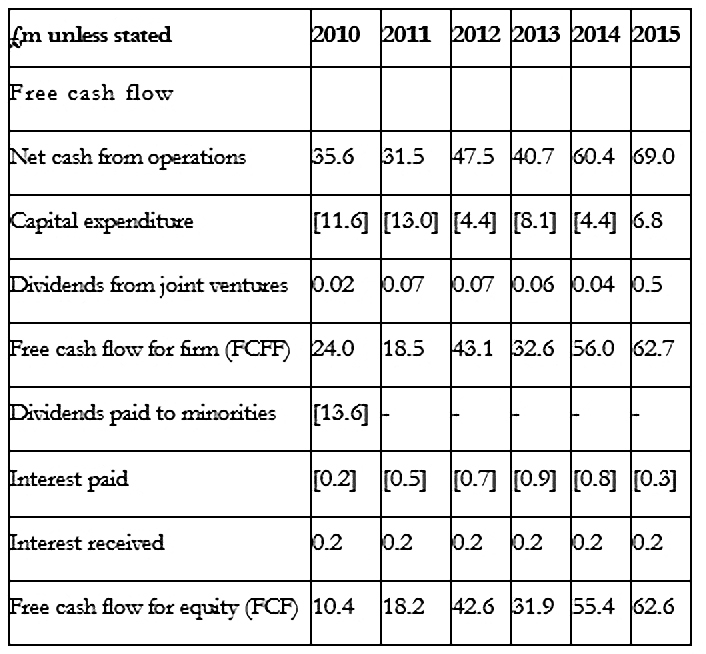 Domino’s invested heavily from 2007 to 2010, and its free cash flow did not cover its dividend. Since 2012 everything has been fine. 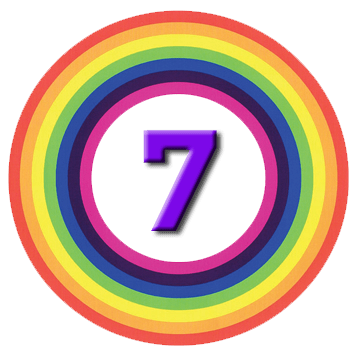 Phil finishes this first part of the book (finding quality companies) with a checklist. 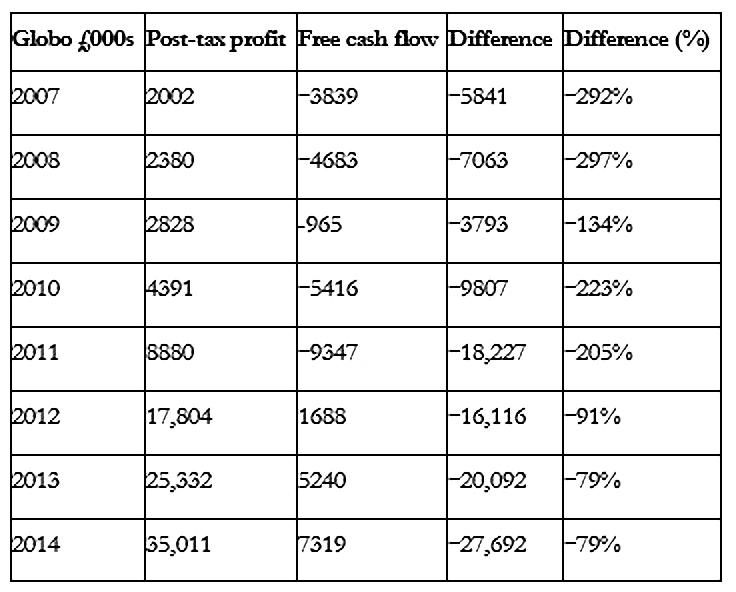 Ten years of growing sales and high and growing profits (normalised EBIT). 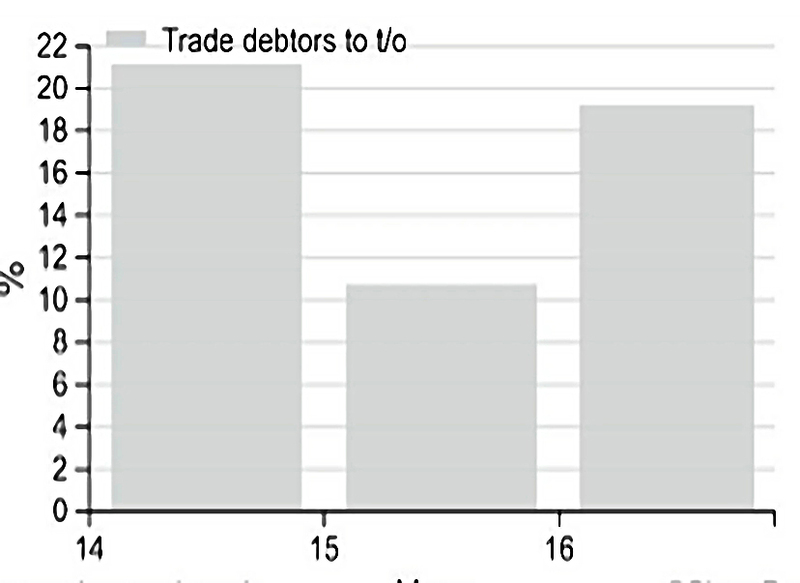 Reported and normalised EBIT should be similar in most years. 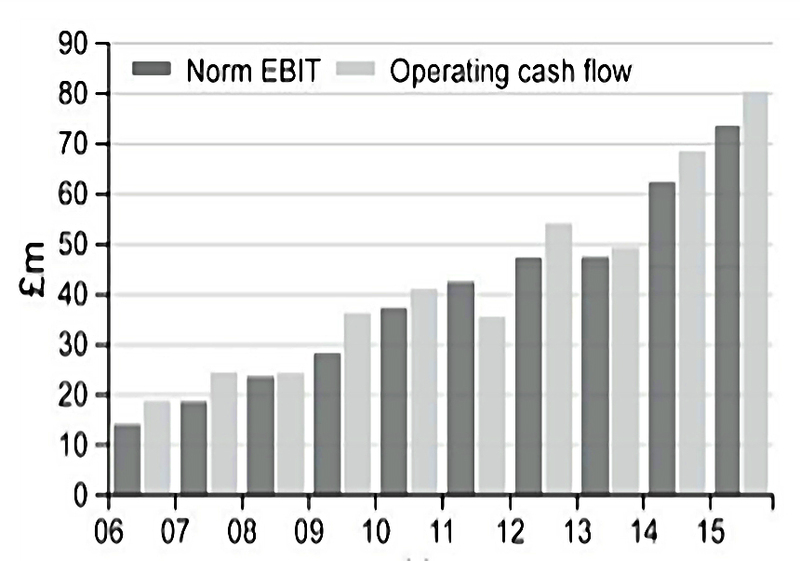 EBIT profit margin above 10% almost every year. 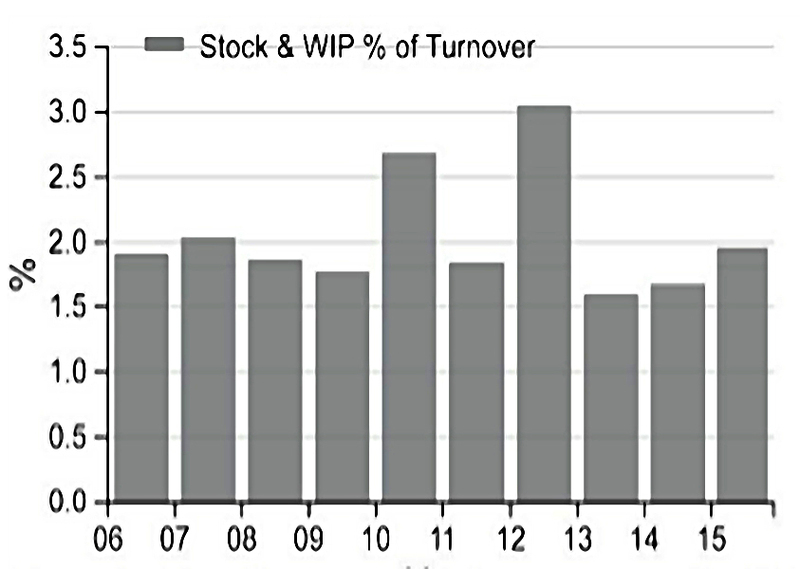 ROCE consistently above 15% for the last ten years. Use DuPont analysis to find out what is driving the ROCE. 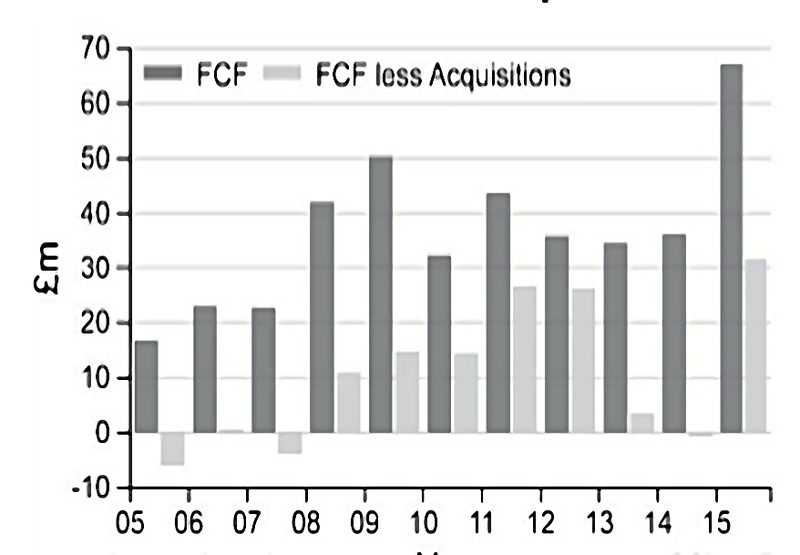 Growing FCFF and FCF, which should be roughly the same. Operating cash conversion (profits to cash flow) of 100% or more. 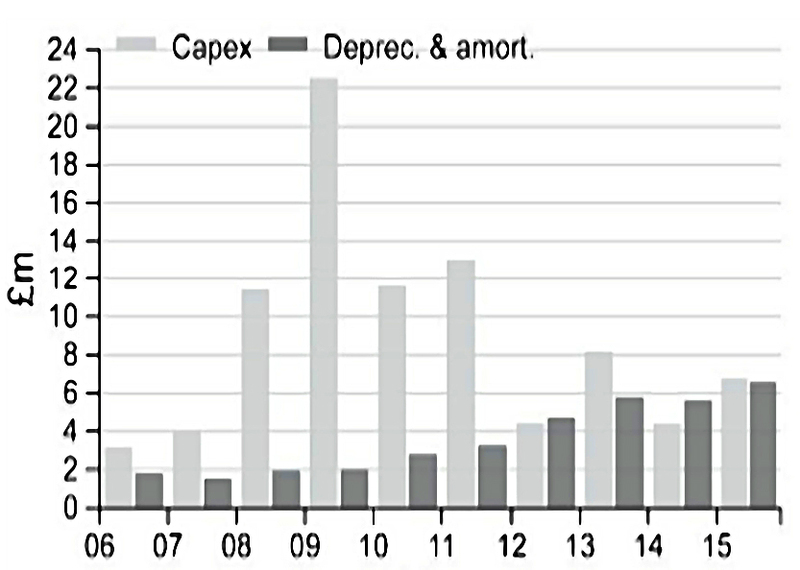 Capex ratio less than 30% almost every year. 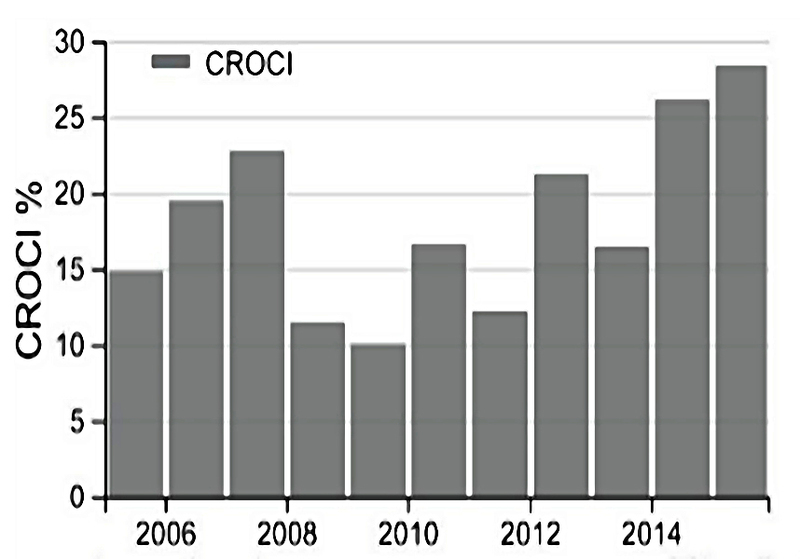 CROCI above 10% each year. 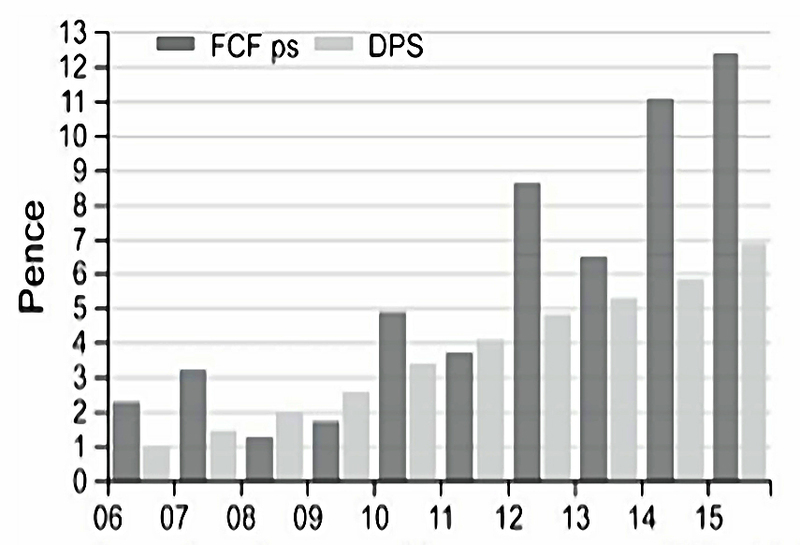 FCFps close to EPS most years. 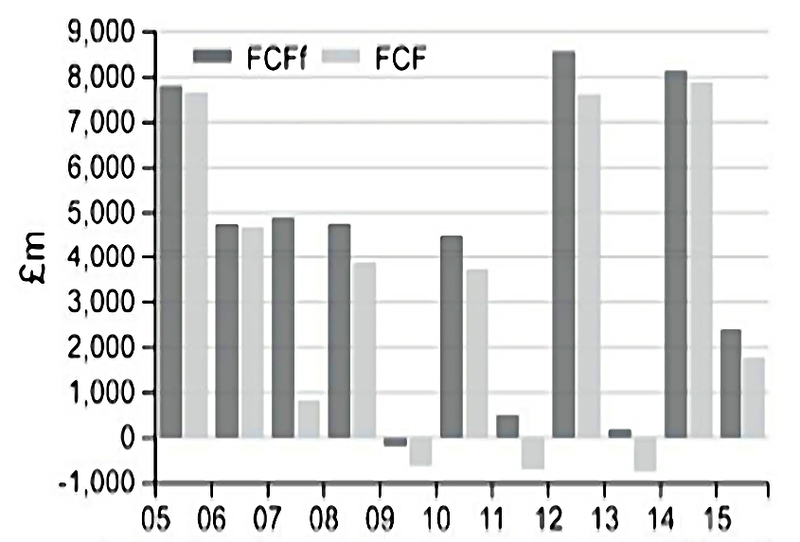 FCFps greater than dividends per share in most years (free cash flow dividend cover greater than 1). Phew! We’ve made it through the second part of the book. It remains a dense but rewarding read. I’ll be back in a few weeks with the succeeding chapters, which are on how to avoid bad companies.